Each of my cakes are created with quality in mind, where taste is just as important than design. I take all of the time necessary to ensure that each cake is a beautiful, edible, artistic creation. Each custom cake is unique, and so is its price. To get a quote for your custom cake, please email or Facebook message me your details (including any photos). Here is some basic, general pricing information that may serve as a starting point. Custom cake prices typically start at $150. Base pricing includes the cake, filling, and a simple one-color buttercream or fondant exterior with a border. Custom design elements are charged in addition to base pricing. The final price of your cake will depend upon the size and the complexity of the chosen design. Sculpted cakes start at $7.50/serving. These cakes involve more materials, skill, time, and detail. If you are ordering a “1st birthday” cake, you may purchase a coordinating 4″ buttercream cake for only $3. What size of cake should I purchase? “How far in advance should I order?” It depends on how much you want to secure your date. Some weeks will book up months in advance, especially during the spring/summer wedding season. The sooner you contact me, the more likely I am to be available on your requested date. I always try to accommodate orders when I can, so don’t hesitate to inquire. We can plan your cake by phone, in person, or by email. The best way to communicate with me regarding your cake order is on my cake Facebook page, where you can both message me and send photos of what you have in mind. Seeing pictures of what you have in mind is very helpful to ensure that we are envisioning the same thing: colors, style, etc! “Simple,” “fancy,” “large,” or “small” can mean very different things to two different people! A non–refundable deposit of 50% of the total price of your custom cake order is due upon booking in order to reserve your date. Remaining balances are due no later than 2 weeks prior to delivery in order to avoid late/rush fees or even a possible cancellation of your order, if necessary. I accept cash, Venmo, Paypal, and credit or debit cards (I use a “Square” reader on my smartphone). For larger, tiered cakes and wedding cakes, having it delivered is highly recommended. Driving with a cake in the car is a learned technique! Once the cake leaves my hands, I am no longer responsible for the safe arrival of your cake. I cannot guarantee cakes from travel mishaps or other such travesties if someone other than myself delivers the cake. Other locations are $1/mile, calculated round trip. Please contact me for pricing. Not just custom cakes . . .
One dozen, basic design: $24 (minimum order of 2 dozen required) Note: A basic cupcake design consists of a piped frosting swirl design, one color, no embellishments. For custom cupcake designs, please contact me for pricing. 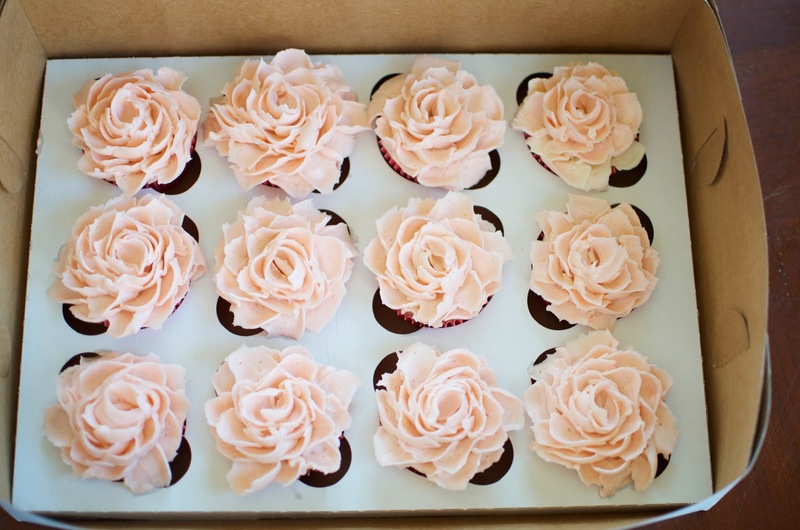 “Wild Rose”Cupcakes: $37/dozen Each petal on these dreamy cupcakes has been piped on individually with a specialty piping tip. These gorgeous confections are created using a rich and luscious Swiss Meringue Buttercream on your favorite flavor of cupcake. 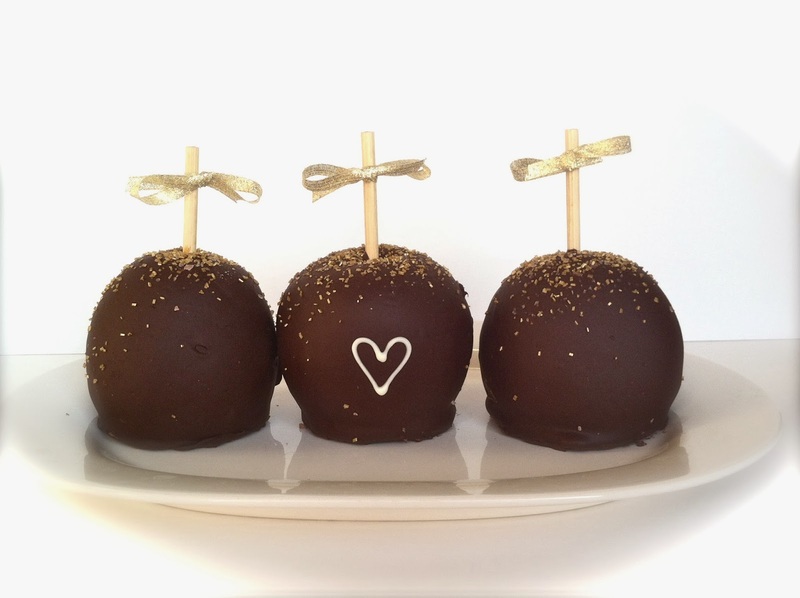 GOURMET CARAMEL APPLES: Priced individually–see my “Caramel Apple” page for varieties and pricing. Minimum order of 10 required, unless otherwise noted. Larger custom orders available. Contact for pricing. I look forward to making your special day even sweeter!